I’m really glad I made it a point some time back not to be greedy and lust after freebies. Because you never know when threats might lurk behind such freebies. I’m sure some people still don’t know about the notorious iPad scams that surfaced in early 2010, so let me talk about it a bit. 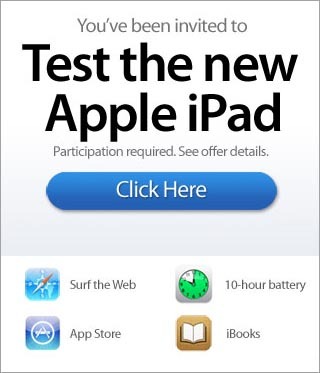 After Apple announced the launch of the iPad, ads suddenly started appearing all over the Internet inviting people to sign up to be iPad beta testers, after which the tester would get to keep the iPad. There were more like these. 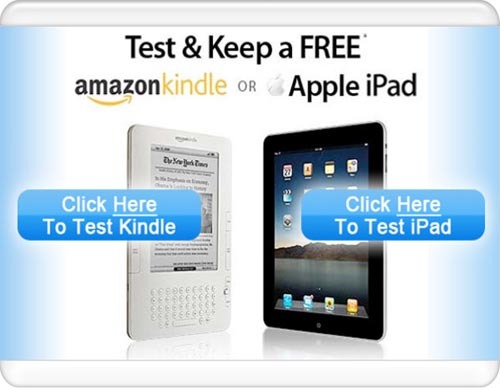 There never were any free test iPad sets. Scammers profitted from these in a number of ways. For one, victims were asked to key in their e-mail and password so that the company could access their contact list and send invites to all their friends to receive free iPads. For another, victims were asked for their phone numbers, which were then used to subscribe to a phone service that automatically added USD10 to their phone bill every week, until the victims realised it and manually opted out of the service. 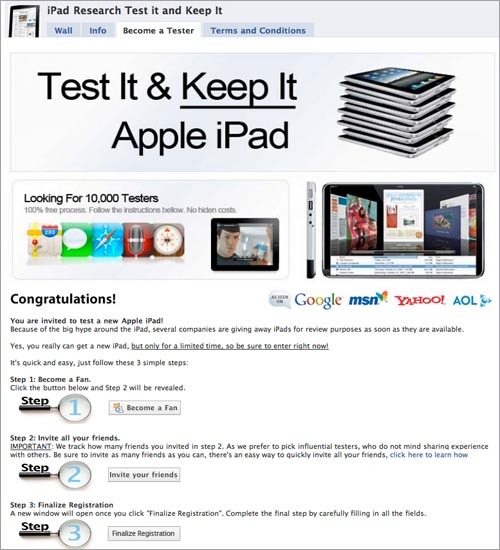 In fact, there were even scamming websites that pretended to warn people about free iPad scams, then go on to invite people to sign up with their company to receive free iPads, providing impressive-sounding (but bogus) reasons to explain why theirs aren’t a scam like the others. People who fell for that ought to be spanked, I think. You can’t believe that people will fall for it, right? But they do. And they will continue to, unless they read this following message! There’s now protection against these kind of scams, and more. Even if you think you’re really savvy, I think it’s still good to have protection just in case you have an off-day. I have always been careful but, a couple of years ago, I still contracted an MSN virus by unthinkingly clicking on a stupid link supposedly sent by one of my friends. I wish I had used the right protection then!! Today, there is one threat online every 1.5 seconds. Just visiting a malicious website is enough to allow viruses into your PC. The solution to all these problems is simple. Get an Internet security software to protect yourself. Now, I know what most people are going to say. They don’t like these software because their PCs get slowed down and they get interrupted in the middle of work or playing games or something. This global Internet security leader has made every effort to provide maximum protection without the inconveniences. Using the Trend Micro Cloud Security Technology, users are only required to download 20% of signature files (as opposed to 100% for other anti-virus software), which are updated frequently and unobtrusively. All Internet threats are identified at the cloud before even reaching users’ PCs. In layman’s terms, this just means that TrendMicro Titanium will not slow down your PC because it uses less memory while offering maximum real-time protection against current and future threats. Virus definition files are updated frequently without you even knowing or feeling it. Best in protection (detection rate) against latest new threats which are created every 1.5 seconds. Test results are conducted in a live environment with Internet connection turned on. This is more accurate as 92% of new threats come from the web. So, who needs this software? Everyone, I think. Following, I present you a scary list. I mean scary considering that scams and viruses are lurking in every corner in our lives. 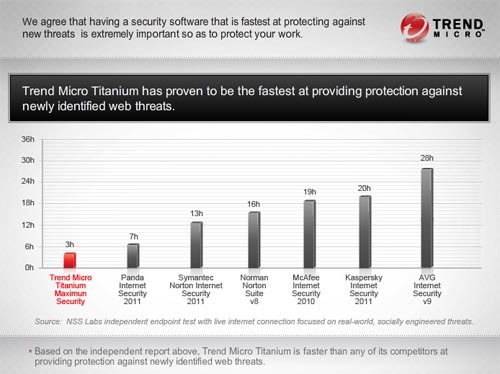 Trend Micro Titanium addresses all these threats and more. I’m sure we all know the importance of having proper protection! Now, besides protection, what’s equally important is also the usability of the software. I found it easy to install and once there, it just sat there quietly and did its work without bothering me. Well, unless it was to inform me that I was about to do something dangerous that would potentially infect my PC. Besides all that, here’s something else that might interest you very much. 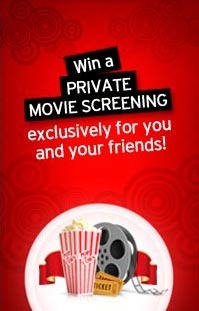 Would you like to enjoy a private movie screening where you can invite up to 63 friends? If you answered yes, which I’m sure you did, then here’s your chance to win one such luxury! 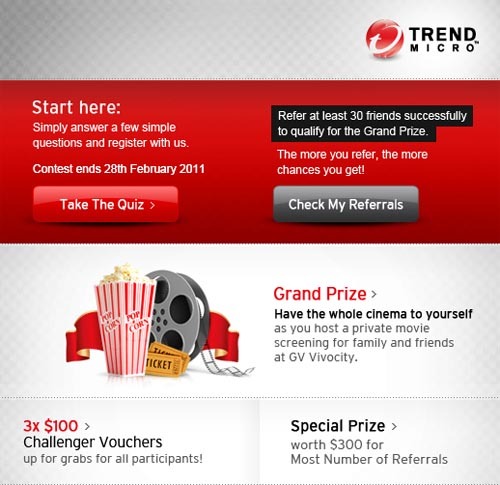 All you have to do is Like the Trend Micro Singapore Facebook Fan Page. Then click on the contest tab to answer a simple question, then follow instructions! It’s really fast and easy, just like how installing Trend Micro Titanium onto your PC is also fast and easy! So, good luck with the contest (if you win, you will invite me to your screening, right? :P) and make sure you’re using the right protection, always! why no info on where to buy this software? or is it free????? @RN1209: Yes I thought she was advertising something else too.